I prefer creating my own location to place my static web pages, so I will create a default folder for my website and update the nginx.conf file to use it. 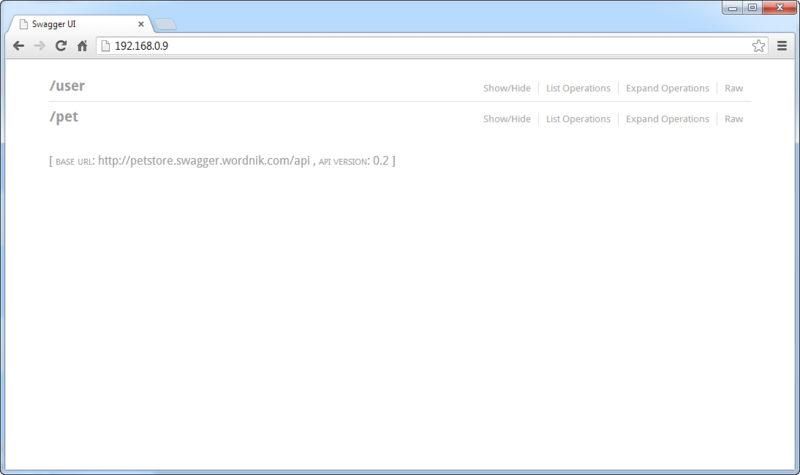 You can get the swagger code by using the git tool. Ubuntu 12.10 does not have git installed by default. Run this command to install git. 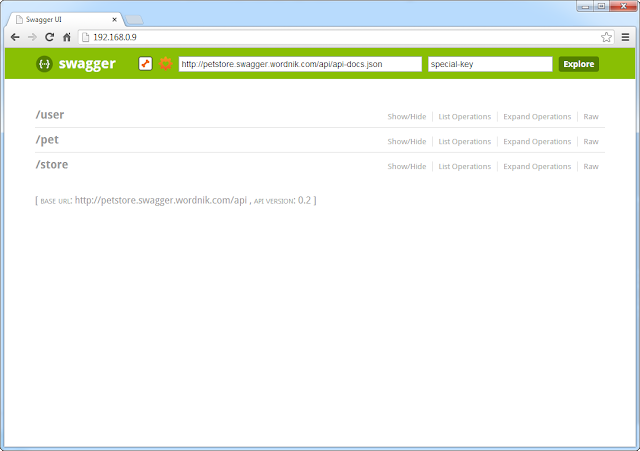 You need to copy the contents of the dist folder located in the swagger-ui folder to the default web site folder of the nginx server. Here is the command to copy those files over. You can click on this example and see how it runs just fine. Create a .htpasswd file with your first user in it (with their passwd). 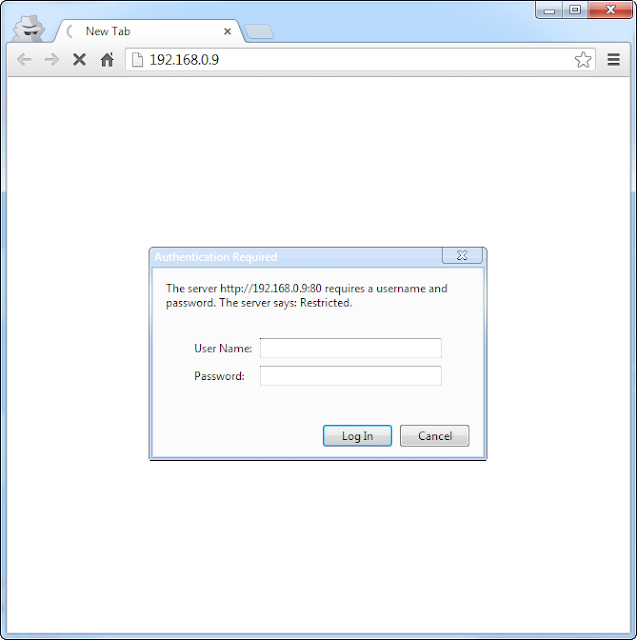 This command will create the .htpasswd with the user "patman" adjust it to your needs. When you run this command it will ask you to type in your password. For each additional user drop the -c (which creates a new file) . 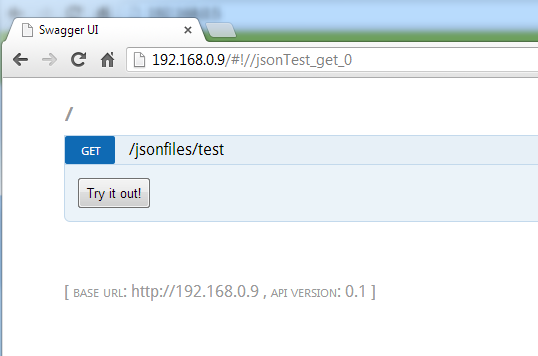 Here is an example that will add a user to your .htpasswd file without creating a new file. This adds password protection to the entire site. Success! It asked for a password. And when I put my username password in it opened up just fine. 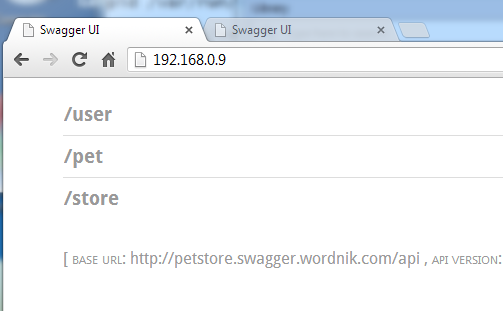 Now I am going to update and examine the default example files given to me by swagger. My goal is to hand make some static swagger files that work. 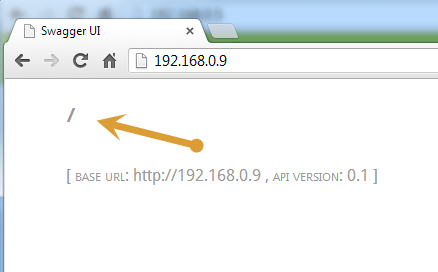 <div class='input'><input placeholder="http://example.com/api" id="input_baseUrl" name="baseUrl"
And the /store api is now missing. For now I am removing the apiKey because I want to start on the very basic level and continue building from there. 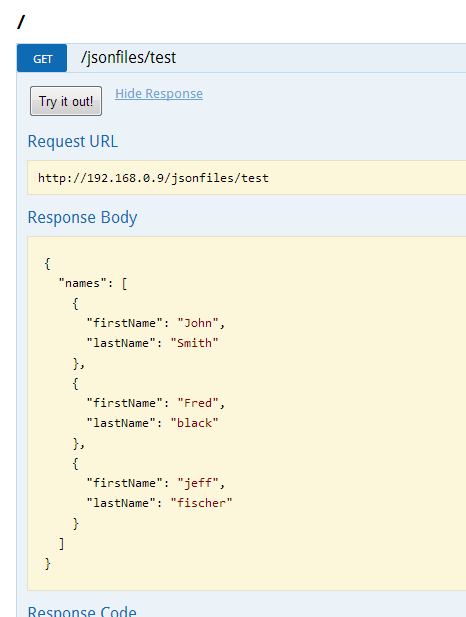 Here is the json file I came up with that only defines one api that is a simple get resource. 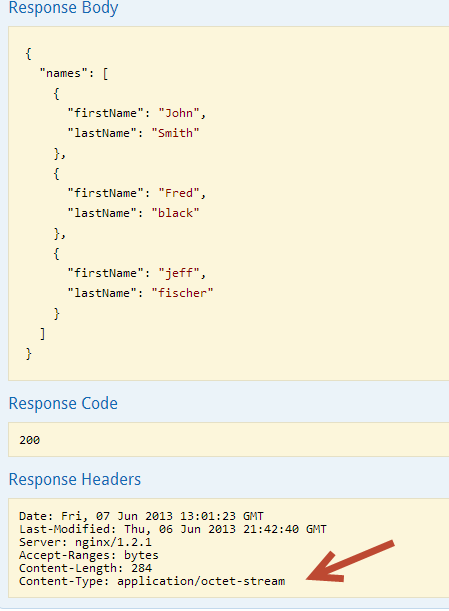 It also shows the response code and the response headers! This could really replace using curl in a lot of simple quick tests that need to be repeated a few times. OK, there is a way to do this, it took me some time but I figured it out. Give me some grace as I may be long winded in explaining this. 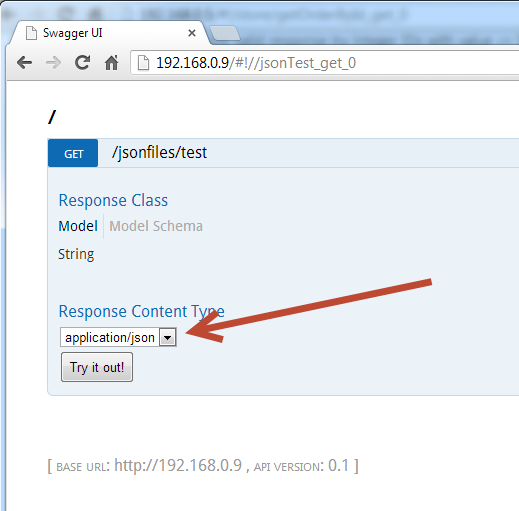 First you need to update you api-docs.json file and change the responseClass in the operation to "String". After you do this you need to add "produces" and specify the content types this resource can be obtained as. 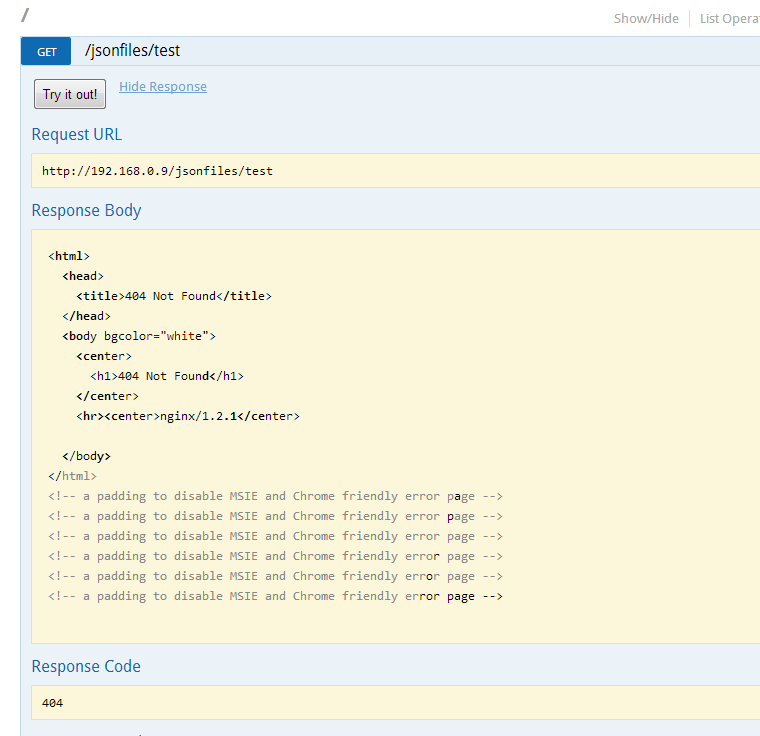 You should see that you now have a pull down showing which Response Content Types you can get. Select one and click Try it Out! It does load, but it gets the wrong Content-Type. 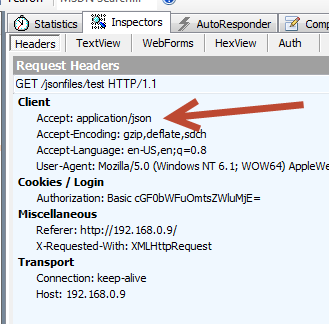 I used fiddler http://fiddler2.com/  to examine the web traffic back and forth. 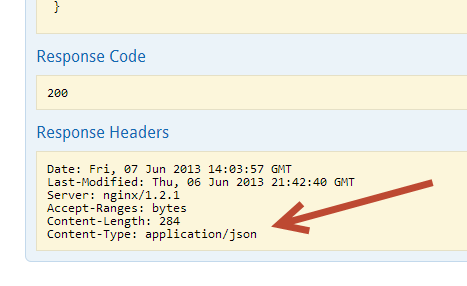 I could see that when I tried to get application/json it did try to get that. 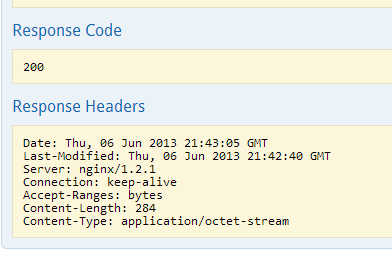 WARNING: when I reloaded the page again it cached the old page so it looked like it was not working. I had to clear the cache to see the results I expected.. If I change and try to get text/html it seems to just be using the cache and I get the same results… When I started a new browser and emptied the cache I got the same result when asking for text/html which makes sense as I set up the folder to do just that in nginx. I think I will call this a success at this point! There is a lot more to go over but I wanted to get the bare basics working. I am sure I will have more write ups on Swagger going over POST, PUT, DELETE, using parameters having your code auto generate a swagger api document, etc. but for today I think this is enough. How can multiple response content types and parameter content type be set? Very helpful. Exactly what I was looking for. Perfect ! If you know how to install swagger editor on swagger, can you also add it please ? I agree with Jerry very helpful, thank you very much!